The living room is a place where you come to relax. 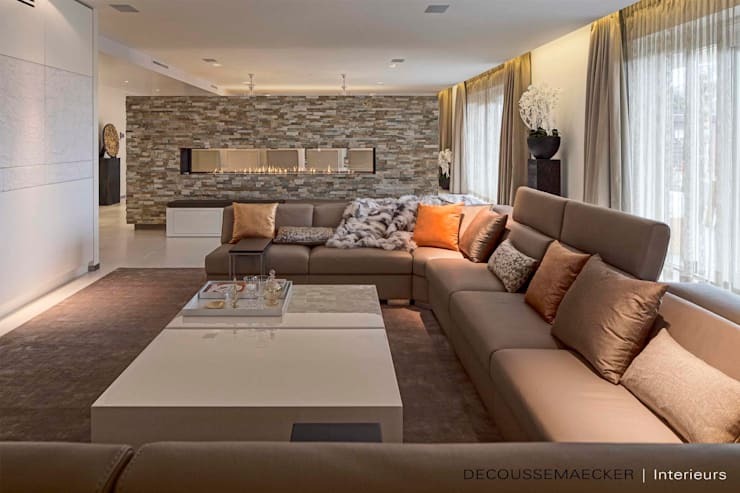 Today we are going to show you a number of luxurious living rooms by home decor and interior design professionals from around the world. We will show you how luxury can be expressed in different ways depending on the materials used, size, colour and function. Homify has collected a whole lot of stunning possibilities for you below, which we hope will be source for inspiration for a smattering of luxury in your living room! The material, the style, the colour. Everything in this room exudes understated luxury. It starts with the big grey tiles, which breaks up the room and produce an incredible effect when light falls on the floors. The grey flooring is extended to the walls, while a wooden side table against the wall brings in a warm and earthy feel. This is pure, natural luxury! At the back, we can see a mirror framed with wood. It's these elements that enhance and add warmth to the grey tones. The large concrete pillar in the center of the room breaks up the space, featuring a television for entertainment and a fireplace for a cozy evening. Luxury can come in the form of a very simple design. This large sofa would accommodate plenty of guests and is perfect for a cozy evening with friends. 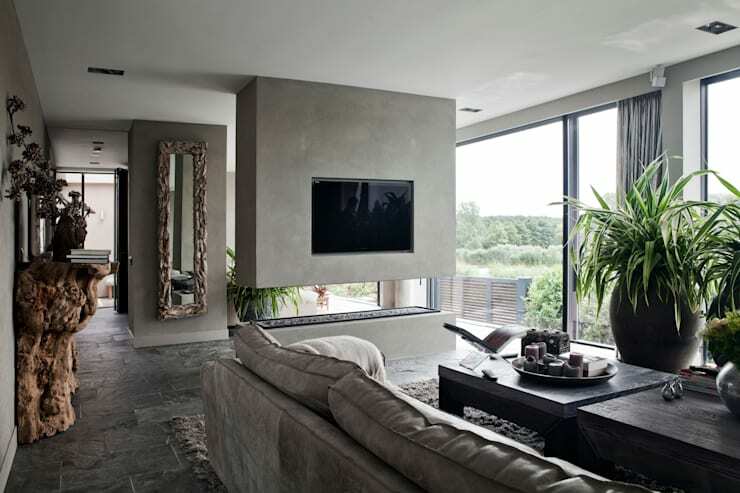 The wall here runs along the length of the room, giving a home to the television and the long, modern fireplace. We can see that the television is sunk into the wall, taking up very little space by not protruding out. This keeps the lines taut and clean. The neutral colours also keep everything peaceful and serene. Here we can see a bright room with a beautiful view. The large windows allow for plenty of natural light to flow into this space.The wall is decorated with colourful artwork. 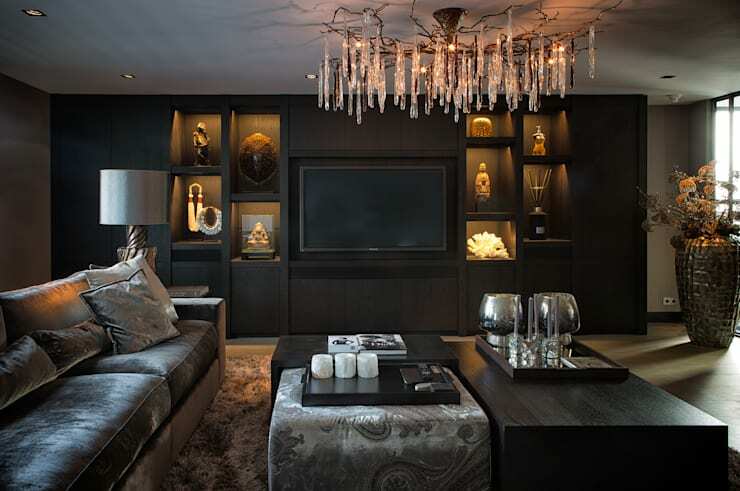 This is a great way to add personal style, while leaving the rest of the living room a more neutral colour. Don't you love how the leather ottoman doubles up as a coffee table, introducing bold accents to the neutral space? The smaller elements in the room add to the luxurious effect along with the vibrant leopard print chair in the corner of the room. This contrasts beautifully with the large, sleek modern sofa. Because the foundation of the living room is neutral, the other styles come together perfectly. The large steel windows in this living room give it an industrial look and feel, while the rest is very sleek and modern. The living room obtains its luxury by combining the industrial with the modern. 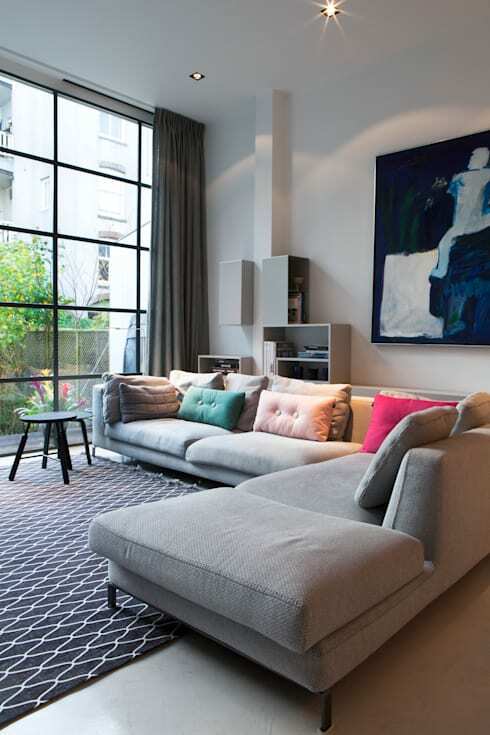 The coloured cushions in the sofa give this space a very cozy and appealing atmosphere. Together with the patterned rug on the floor, this makes for a much warmer space. The large piece of artwork on the wall is the focal point of the living room, however, bringing all of the colours together. The large windows allow natural light to flow into the space so that the dark colours of the artwork don't overwhelm the living room. The cabinets along the back of the room are very unique, providing storage space with an artistic design. This living room is located in a waterfront villa. 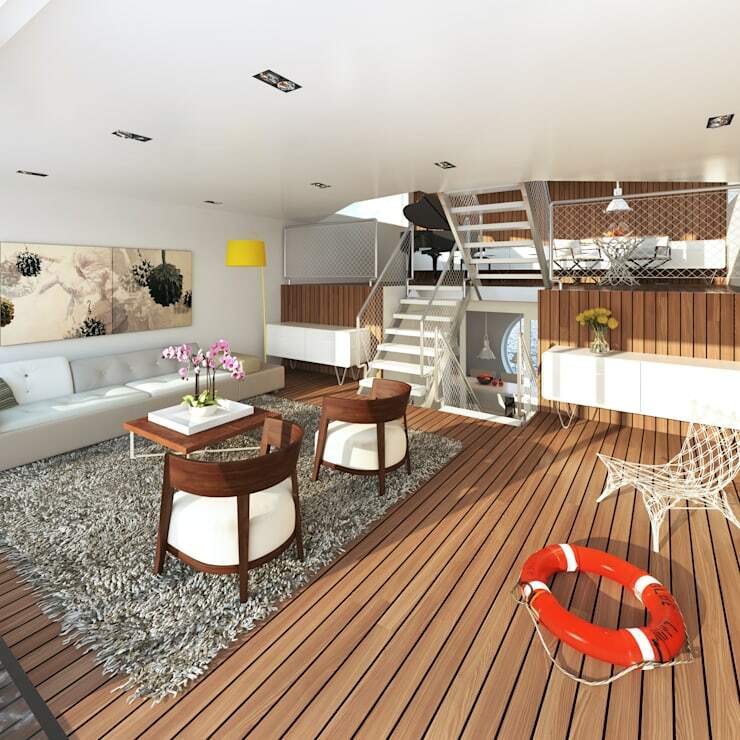 The split level division of the house ensures that all rooms are optimally linked for a very open atmosphere. In this space, we can see how wall art and a beautiful rug on the floor is key to a homely yet luxurious living room, along with little touches here and there. The tall cupboards at the back of the room also offer plenty of storage space to keep items that shouldn't be on display neatly out of sight. Have a look at these other cool simple storage solutions. A very sweet and subtle way to add luxury to the living room is to use soft pastels. 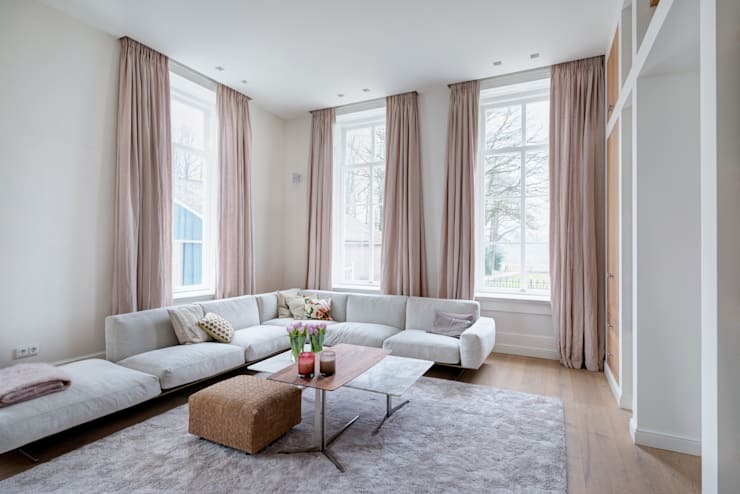 The high windows with the curtains that run from the ceiling to the floor also add height to the room. The soft hues in the form of the furniture and the accessories keep the room looking very spacious and light. What's is only partly visible in the image, but is certainly very important, are the high cupboards. Featuring sturdy wooden planks and doors, they are a beautiful contrast to the softer colours found throughout the rest of the living room. Natural colours and materials can truly enhance a living room. In this image, we can see how the stone wall that features the fireplace subtly separates the dining room from the living room. This adds a rustic touch the space, making for a very elegant living room. The colour palette is neutral but playful, where different shades and textures been introduced. After a delicious dinner, you could relax here in luxury! 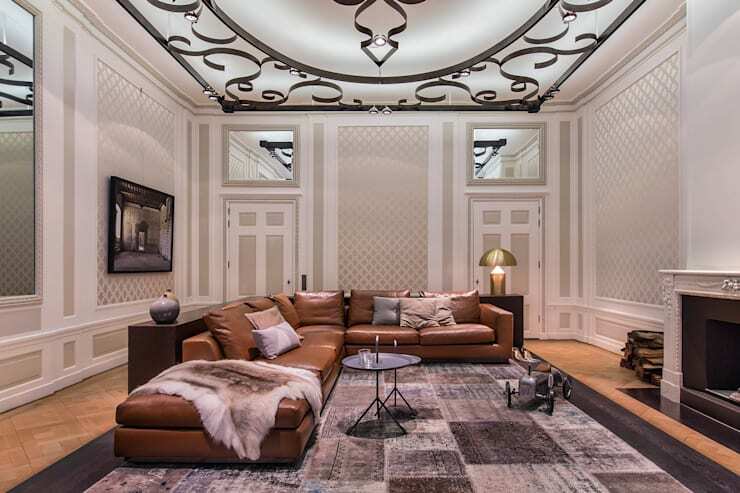 Dark colors in the living room can be extremely attractive, if combined well with bright accents and beautiful lighting, as we can see in this living room by BB Interior. The dark shelving provides storage but thanks to the backlit shelves, is also the perfect space to put accessories on display. By lighting up the accessories, you do them even more justice. The chandelier also adds incredible atmosphere to the space. The graceful shape is reminiscent of ivy in terms of how it trails up the ceiling. What a beautiful combination of old and new! The old wooden ceiling beams and touches here and there contrast dramatically with the stark white walls and ceiling while tones dominate this space. This also ensures that some items stand out. The old flea market style cabinet finished in a dark wood is beautiful, introducing a charming and more traditional touch to the modern living room. The fireplace and chimney goes all the way up into the white ceiling, while the soft grey sofa focuses our eye back into the room. This is a simple but very stylish and effective combination. To be honest, this room would exude luxury even without furniture. The original features of the room combine beautifully with the modern interior furniture. The floor is decorated with a large rug that features a palette of different shades. The different textures and colors provide a good foundation for the style of the room. The living room is enclosed by a cabinet, which breaks up the large space. The walls and doors all feature very traditional elements that enhance the luxury of the space. The real highlight of the space, however, is the magnificent structure on the ceiling that features the sunken in lighting. This is truly one of a kind! If you feature a few big elements in a living room that attract attention, you can have a much more luxurious look and feel than if you just include a few small accessories. Less is more! 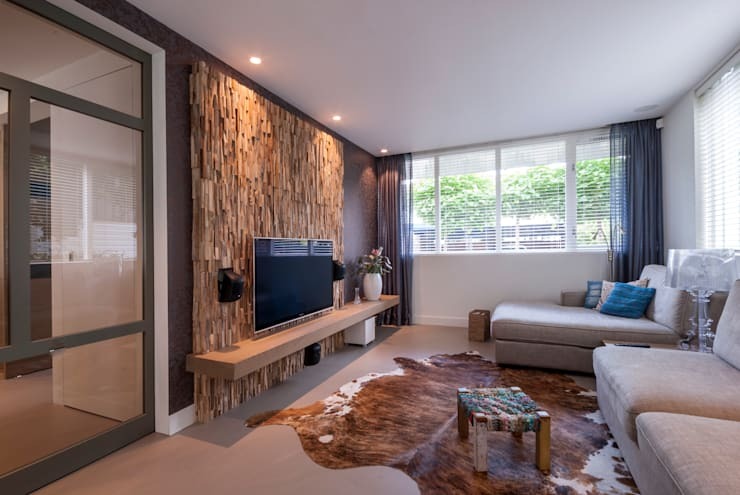 The elements that draw the most attention in this living room are the wooden wall behind the television and the big animal-skin rug on the floor. This is very stylish! A simple clean shelf under the television is thus all that is needed. Its colour allows it to blend seamlessly into the wall behind it, while it still offers the television and a few decor items some support. This is a nice alternative if you don't want shelves. If you've enjoyed this ideabook, you'll love these tips to create a really cozy living room. Which is your favorite living room?